Sydney Film Festival, Felix Media and Carriageworks present a FLUX: Art + Film masterclass. Festival guest, Andrew Kötting, co-writer and director of Lek and the Dogs will lead a masterclass, an inspiring event for all free-spirited filmmakers and aspiring creatives. Artist and filmmaker Andrew Kötting has directed numerous, resolutely independent, short films and feature films, and performed across the UK and Europe. He’s been awarded prizes at international film festivals and won many commissions. He also produces books, CDs, LPs and paintings, many in collaboration with his daughter Eden. He teaches part-time as a Professor of Time Based Media at the University for the Creative Arts, Canterbury. Andrew will share highlights from his thirty-year career, and talk about his approach to performance and filmmaking. In particular, he’ll dig forensically into the way in which Lek and the Dogs was developed and made. Andrew Kötting is one of Britain’s most intriguing artists, and perhaps the only film-maker currently practising who could be said to have taken to heart the spirit of visionary curiosity and hybrid creativity exemplified by the late Derek Jarman. Formally exploratory and aesthetically innovative, like Jarman he is also a great collaborator, building around his various projects a community of shared interest, while anchoring his prolific production in an ongoing report on the lives of those closest to him." - Gareth Evans, curator, critic and cultural commentator. Felix Media acknowledges Screen Australia's Enterprise Industry support. The final film by the great, late Iranian filmmaker Abbas Kiarostami, 24 Frames is an exquisite dialogue between his work as a filmmaker and fine art photographer. The world premiere of Melbourne archivist and filmmaker Sari Braithwaite’s provocative documentary, stitched together entirely from film footage cut by Australian censors. 10,000 hours of real surveillance footage is culled down into an engrossing fictional narrative, in this extraordinary debut feature by celebrated Chinese printmaker Xu Bing. American sculpture, installation and performance artist Amy Jenkins turns the camera on her family’s most intimate stories, recording a heart-breaking year of births and deaths. A mesmerising narrative film meets art piece by British experimental artist Andrew Kötting. Inspired by the true story of a four-year-old who lived with wild dogs in Moscow. Acclaimed visual artist Shirin Neshat (Women Without Men, SFF 2010) returns with a multilayered film within a film, about the Arab world’s most beloved singer, Oum Kulthum. Highly political two-person art collective Soda_Jerk return with the brilliant cinema mash up TERROR NULLIUS, a hilarious, uncomfortable reimagining of Australia’s national mythology. Renowned Belgian video artist David Claerbout redraws Disney’s 1967 classic The Jungle Book, removing the animals’ ‘humanisations’. Felix Media is proud to announce the World Premiere of Jirga at Sydney Film Festival 2018. Jirga has been selected for The Official Competition - a group of twelve films recognised for being ‘audacious, cutting-edge and courageous’. Jirga is in great company, with films from a variety of exciting filmmakers, including Spike Lee and Debra Granik. Jirga, directed by Benjamin Gilmour (Son of a Lion, 2010), is a modern morality tale about a former Australian soldier, Mike, who returns to Afghanistan to find the family of a civilian he accidentally killed during the war. Seeking forgiveness, he puts his life in the hands of the village justice system – the Jirga. Jirga is a film made under extraordinary circumstances. Director Benjamin Gilmour and Sam Smith arrived in Pakistan to find their funding had been withdrawn and their movements monitored due to Pakistan's secret police deeming their script too political. They could've come home to Australia, but decided to make the filmanyway, in Afghanistan. They had a tiny crew; shoot scenes at 10 times the rate of a normal feature film; and spent nights listening to gunshots and mortar fire. They came back to Australia with some shaky footage and ropey sound. Producer John Maynard saw a story underneath all the dirt on the lens and together with editor Nikki Stevens; Sound Designer Liam Egan; and Composer AJ True; created a sensitive and compassionate tale on the impact of war and the cost of redemption. Jirga has three screenings over the festival and an extended Q&A with director Benjamin Gilmour, lead actor Sam Smith and producer John Maynard. Bridget Ikin has been awarded an honorary doctorate of Arts, Film and Television from AFTRS. She received the award in recognition of her significant contribution to the screen industry. In her graduation speech Bridget described the key principals that underpin her work as; a commitment to collaborating with women; to advocating for diversity; and to looking for unexpected stories at the edge - a commitment to which has brought her a great deal of creative satisfaction in her 30+ year career, as a storyteller. Six Australian artists embark on a nostalgic journey back to a place of their past to confront memories that will inspire a self-portrait work. Filmmaker Sam Matthews sets out to meet other gender-diverse Australian artists, challenging each of them to create a new artwork based on the theme “Unboxed”. Twins Carla and Lisa Wherby, Auburn-based artists are besotted fans and collectors of Australian popular art and culture. Invited to enter the National Self-Portrait Prize, this series captures them meeting their art heroes. On the cusp of his 28th birthday, Anthony goes to America to learn from the great song spammer Matt Farley. Can he write and record 100 songs in 10 days? Art Bites is a joint ABC ARTS and Screen Australia initiative. 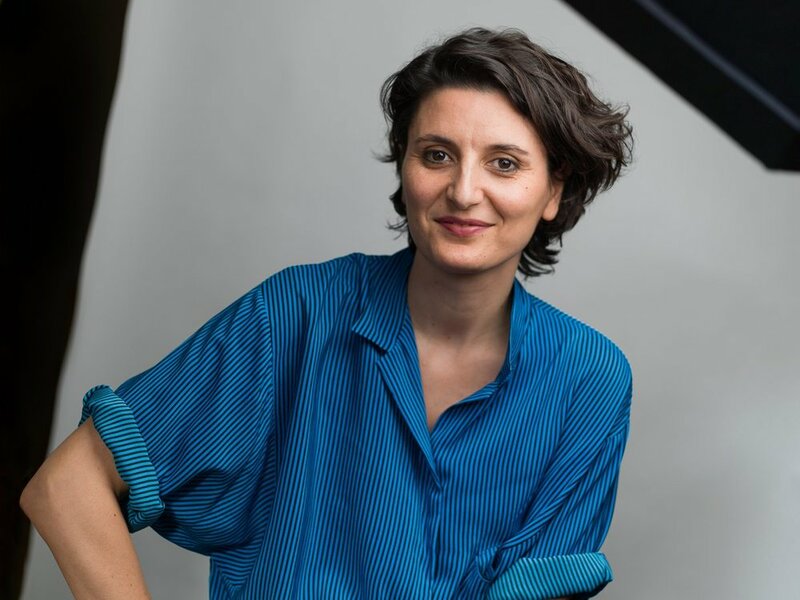 Angelica Mesiti has been selected to represent Australia at the Venice Biennale 2019, together with curator Juliana Enberg. The chair of the selection panel, Professor Callum Morton from Monash University, said that Mesiti’s proposal was highly regarded by the selection panel and that they were looking forward to seeing the project realised in the Australian pavilion. Angelica Mesiti's Mother Tongue will it's Australian premiere at the 2018 Adelaide Biennial of Australian Art: Divided Worlds. Paris–based Australian artist Angelica Mesiti’s Mother Tongue – a sumptuous two-screen installation – is in many ways a perfect distillation of Divided World’s themes. Mesiti’s video juxtaposes the musicians and performers of immigrant communities in Aarhus, Denmark, with Danish-born choirs singing traditional songs. Like her recent work that combines music of various cultures, the video finds a commonality between people. Angelica Mesiti's Mother Tongue, commissioned for the European Captial of Culture - Aarhus 2017 celebrations, premiered last night in Denmark at O Space, Aarhus. Taking the Danish tradition of communal group singing as a starting point, Mother Tongue explores the way diverse communities in and around Aarhus connect to their cultural heritage through music, dance and song. The work was produced with the participation of a range of performers from Aarhus including school children, employee’s of Aarhus Kommune, the Ramallah Boy Scouts troupe, the Jaffra Dancers, Gellerup Circus School and residents of the housing development, Gellerupparken. From popular radio hits to traditional folk songs, Somali blues, marching drills and wedding dances, Mother Tongue explores a series of communal, creative activities shared across the urban, civic and residential spaces of one European city. Mother Tongue uses music as a way to sketch a portrait of society as we see it today, where individuals and groups seek ways to maintain their own cultural values while integrating into a new place rather than assimilating. Musical tropes like synchronicity, harmony, dissonance and discordant associations build to generate an image of juxtaposed realities. Mesiti has created a complex new melody where traditional and newer unexpected rhythms can evolve. The exhibition runs 10th November - 10th December 2017. Commissioned by Aarhus 2017- European Capital of Culture with additional funds from the Adelaide Biennale. We’re so pleased to share that long-time Felix Media collaborator Angelica Mesiti has a survey of her work at the National Gallery of Australia in Canberra. The five works include Rapture (silent anthem) 2009, Citizen’s Band 2012, The Calling 2014, Nakh Removed 2015 and The Colour of Saying 2015. The survey runs 9 September 2017 – March 2018. More information about the works available here. We’re thrilled to announce the funding of our art+film initiative, thanks to the Screen Australia Enterprise Program. With the support of the grant, John Maynard and Bridget Ikin will continue to nurture talent, supporting innovative artists and filmmakers.Read the Screen Australia press release here.